32 Rules for made dishes Before you put Eggs or cream into a white sauce, have all your ingredients well boiled and thickened, for neither eggs or cream will contribute much to thicken it; after you put them in, do not stir them with a spoon, or set your pan on the fire, lest it should gather at the bottom and grow lumpy, but hold the pan at a proper heigth from the fire, and keep shaking it one way, which will prevent the sauce from curdling, be cautious not to suffer it to boil, and remember to take out the meat with a fish slicer, and strain the same upon it. Drain fried forcemeat in a sieve and never let it boil in the sauce, as it will soften the balls, but put them in after the meat is dished. 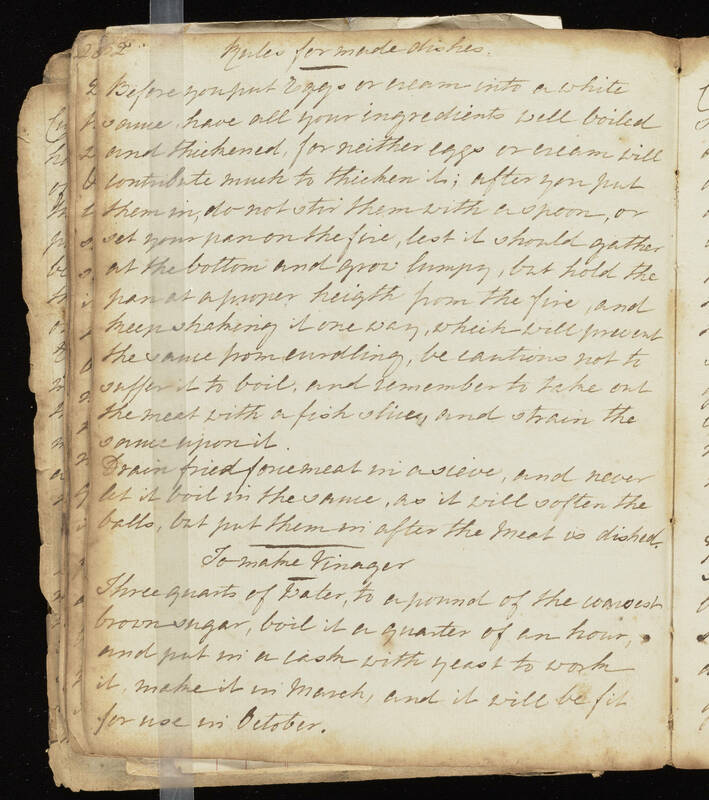 To make Vinager Three quarts of Water, to a pound of the coarsest brown sugar, boil it a quarter of an hour, and put in a cask with yeast to work it, make it in March, and it will be fit for use in October.